Washington (CNN) - Six months before a national election whose results could hinge on which party turns out more supporters, House Democrats unveiled legislation Thursday they say is needed to ensure all eligible voters have unfettered access to the ballot box. 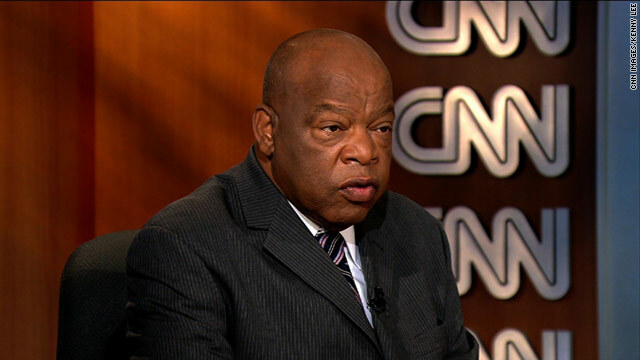 "The vote is the soul and the heart of the democratic process, People died for the right to vote, and some of them were people I knew," Rep John Lewis, D-Georgia, a leading figure in the civil rights movement said at a Capitol Hill press conference. "I hope and pray that we will not return to the days of overt discrimination, before we decide to do something about it." Lewis said that three million voters were turned away at the polls in 2008. Democrats and civil rights advocates who worked on the measure over the last few months argue barriers are increasing that could disenfranchise voters across the country this November. They cited 16 states where same-day voter registration has been eliminated, rules in some states adding requirements to what kind of ID voters need to show to get a ballot and inadequate training for poll workers. The Voter Empowerment Act would allow same day registration online, require schools that get federal funds to offer voter registration drives, and give states money to train poll workers. It also classifies voter "caging" as a felony. This is the practice of sending mail to addresses with the aim of creating a list of people whose mail is returned as a way of challenging someone's voting status or purging the rolls of names. House Democratic Whip Steny Hoyer, D-Maryland, summarized the three key aims of the bill as "access, integrity and accountability." While several Democrats at Thursday's news conference complained new state laws changing identification rules were deliberately designed to suppress the vote, and amount to a form of a "poll tax," their bill does not address the issue. South Carolina Rep Jim Clyburn noted every voter needs to produce identification, but they decided to set that issue aside as states continue to litigate it in the courts. Democrats are pushing for prompt action on the bill, but Rep Dan Lungren, the GOP Chairman of the House Administration Committee which oversees voting system, has not said whether the committee will take up the measure. The bills' sponsors said they want bipartisan support, but they introduced it before showing it to Republicans on the committee. A senior Democratic aide tells CNN that the Democrats on the Administration Committee plan to send a letter urging action on the bill, attempting to apply some pressure on the Republican House to address the issue before the election. Of course the Democrats do not want voter identification, it might prevent them from getting the illegals vote. Democrats know they will lose the elections and the Presidency this year. they are shaking in fear, and i am loving it. You mean Stuff the Balot Boxes like Lyndon Johnson did in 1947?? What a great outcome that was. The start of a now 16 Trillion Dollar Debt that may finish this Country. Is that what you want?? I can say this there never was any Black Panther at any polling place. If there had been they would still be in jail. Those were people put there by some one who paid them a little bit of money, they sold their sole for a dime. They would sell their own mother.